*I just finished watching the documentary film, The True Cost, which highlights fashion as a $2.5 trillion dollar business that’s only second to the most polluting industry on Earth, oil. The impact our greed has had on the environment and human lives is enormous and tragic. Waking up to the reality of life is challenging. Until it directly affects the quality of one’s life, motivation remains absent. Recognizing the dangers and making important compromises and changes based on intellectual awakening rarely happens. Once we reach the 11th hour and all hell is ready to be unleashed, bandages are used to temporarily prevent the dam from breaking. If our society doesn’t pull it’s head out of the sand, our future may best be described as bleak. 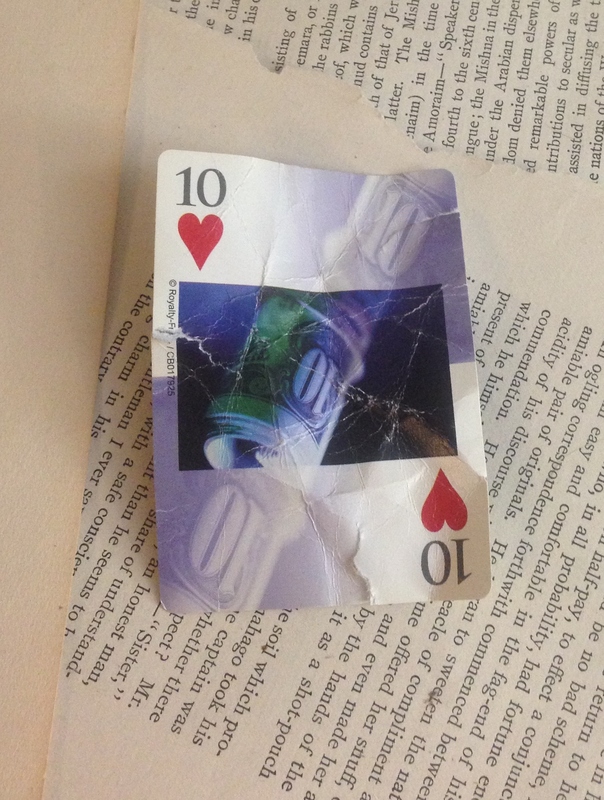 The crumped playing card with a faint image of money is an unusual and striking image for environmental degradation. I do like the haiku; would like it better w/o “Poor” in the last line. That use of the word harks back to the 19-th century, when poets often detracted from their descriptions of what moved them by exhorting readers to feel as they felt. Vivid imagery beats exhortation. You’re right about the word, poor. I felt the last line lacks the punch of that aha moment. Never was crazy about leaving the haiku as I did. Excellent analysis. I happen to like the last line, one because mother earth is so unexpected with the first two lines, two because it is remains if the mother earth is the one who was raped or is weeping for one the living beings she embraces. Poor can be thought of both lacking (if she is the victim) but also a sympathetic view of another’s view (if she is reacting to the tragedy of another). Wow! I’ve always been amazed by how you interpret my poems. LOVE that….thank you! Interesting. I never noticed the ambiguity; I just assumed that Mother Earth was the victim. W/o “poor” there would be a more balanced ambiguity. Calling X “poor” outside of a very narrow context suggests that the poet wants the reader to pity X, and pity for X because X is a victim comes more naturally than pity for X because X pities a victim. Tho I still prefer reliance on strong imagery to anything that urges the reader to feel a certain way, I am glad of a chance to be in a thoughtful discussion of differing views. That is a refreshing break from the nastiness of contemporary politics. Thanks. I have made a vow to avoid getting into political discussions because it agitates me too much because I get so intense and have an opinion on everything (not to mention an occasional impulse to be a gadfly) that it is not good literally for my mental health. I look forward to engaging this wonderful community in a thoughtful discussions.